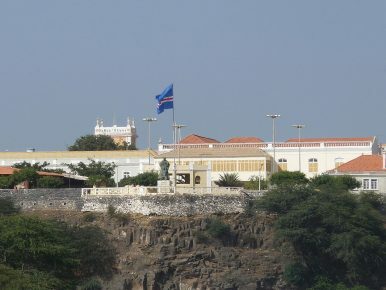 The presidential palace in Cape Verde, which was expanded with Chinese assistance. Why is China so interested in one of Africa’s smallest countries? As the United States enters into a decade hallmarked by its decline much of the developing world has begun to look toward the East, in the form of China. African countries in particular have joined the fray, with China pledging to invest $60 billion into the continent. It is easy to see why such an investment from China would make sense in countries like Sudan, with its oil wealth, or South Africa, with its gold and mineral reserves. However, what is less clear are the motivations behind Chinese interest in the small archipelago off the coast of West Africa — Cape Verde. Ever since the two established bilateral relations in 1976, China has played a significant role in the development of Cape Verde. Today Chinese-erected public buildings, such as the presidential and governmental palaces, cover the Cape Verdean landscape. Citizens today enjoy Cape Verde’s first national stadium, built by China and hailed by then-Chinese Ambassador Su Jian as “the greatest construction after Independence” on the island nation. Chinese investments in key economic sectors such as real estate, infrastructure, service industries, and tourism have created an island of stability only 300 miles off the coast of West Africa. Cape Verde has been praised by the United Nations as a success story, an example that other African nations should follow. The relationship with China seems critical for Cape Verde. As a small nation, it is bound to benefit from Chinese investments. For China, however, the benefits seem less clear. After 37 years of diplomatic relations, Cape Verde has proven to be “a faithful friend,” as former Ambassador Su Jian declared. A shared history of oppression and a common struggle for independence act as binding glue in solidifying this “faithful” friendship. Although Cape Verde has little to offer in the realm of natural resources, the nation enjoys an important geostrategic position, giving China an essential influence at the heart of the Atlantic. As China begins to seek new naval bases throughout the globe in hopes of securing its trade routes, Cape Verde’s geostrategic position might prove to be of significant military interest. When dealing in Africa, it is always difficult to get over regional instability. China has no direct qualms about dealing with dictators as long as their regimes prove to be stable. However, African dictators are, for the most part, anything but stable — a reality that is confronting Chinese leadership in dealing with Sudan’s Omar al-Bashir and Zimbabwe’s Robert Mugabe. A culturally rich, economically and politically sound state, Cape Verde seems to belong to an entirely different continent. This stable island in a sea of instability has proved to be an essential partner in China’s vision for Africa. As crucial as Cape Verde is today in serving China’s African goal, their economic partnership did not begin until 1995 when Chinese traders decided to invest in the archipelago. Soon after the first Chinese traders appeared, a sea of department stores followed. Today it is estimated that as many as 400 Chinese stores are located on the islands, enjoying a stable supply of consumers, and thousands of Chinese are to be found throughout the archipelago. However, Beijing’s interest in the archipelago does not seem to be economically driven; after all, trade between the two countries remains a dismal $42.6 million. Chinese interest in Cape Verde seems aimed toward reshaping the People’s Republic’s image when it comes to dealing with the developing world. A stable and secure state with a positive international outlook provides fertile soil in spreading Chinese culture. The Cape Verde-China Friendship Association has played a major role in the building of this cultural bridge throughout the archipelago, continually holding the annual Chinese Culture Week in hopes of strengthening cultural understanding. Claiming that China is practicing modern-day colonialism in Africa becomes a much more difficult argument to make when one looks toward the country of Cape Verde. When looking at Cape Verde-China relations, obvious signs of a new Chinese approach in dealing with Africa can be seen. Beijing’s image when it comes to Africa has often appeared as that of a hungry economic machine, but when one looks at Beijing’s relation with this small, stable, African democracy, that image appears to be inconceivable. The idea of China as a nation embedded with anti-human rights sentiments becomes harder to justify when faced with the reality of Cape Verde’s success story, which was only made possible by Chinese aid. However, Cape Verde is only one country; the People’s Republic will need to adopt the same successful strategy when dealing with the whole of Africa. Pedro Ramos is a Cape Verdean International student at the University of Bridgeport studying International Political and Economic Diplomacy.